Packed with apples and oats, flavored with cinnamon and brown sugar this "guilty pleasure" is a guilt free treat! Yes, while we think our vegan apple cinnamon oatmeal cake may be a "guilty pleasure" it is indeed a vegan "guilt-free" delicious treat. Loaded with oatmeal and apples this cake is so tasty you're guests will have a very difficult time saying "no thanks"! Combine 1 tablespoon of quick cook oats, the brown sugar, 1 teaspoon of cinnamon, the allspice and 1 tablespoon of flour in a small bowl and set aside. Cream the Smart Balance and granulated sugar in a mixing bowl until thoroughly mixed and fluffy. Add in the egg replacer and vanilla and beat for about 3 minutes. Combine 1 1/2 cups of flour with 2 teaspoons of cinnamon and stir in the baking soda and baking powder. Stir in the egg replacer mixture and the rice milk and mix just until blended. 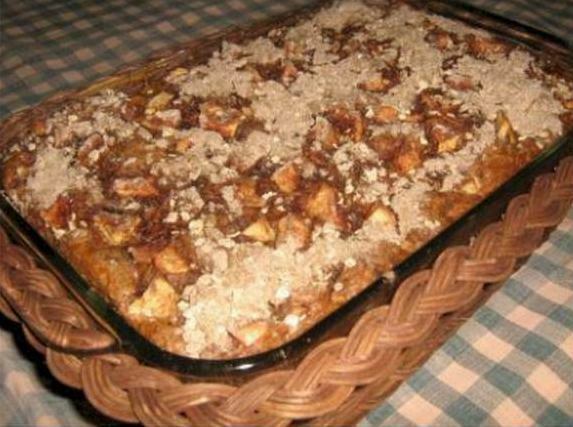 Set aside about 1 cup of the diced apples and fold the remaining apples and 1/2 cup of oats into the batter. Lightly spray an 11 X 7 inch baking dish with baking spray. Using a spatula, turn the batter into the baking dish and evenly distribute it across the dish. Scatter the reserved apples on top and sprinkle with brown sugar and oat mixture. Bake at 350°F for 35 to 40 minutes. Test with a toothpick stuck in the center to judge when the cake is done - it should come out clean.